Do not worry about SharePoint re-downloading the same script repeatedly if you use it to render multiple elements, SharePoint will not download a script more than one time. Can not perform this operation. The file is no longer checked out or has been deleted. 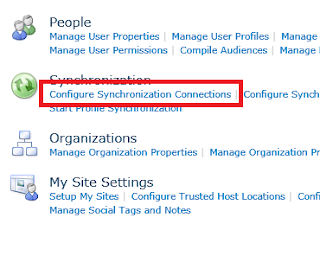 The cause of this issue is you have connected SharePoint Designer 2010 to an Alias for the site (DNS CName) which has not been configured as an Alternate Access Mapping for the site (AAM). Connect SharePoint Designer 2010 to the host name while performing these file operations. Not ideal but will work. 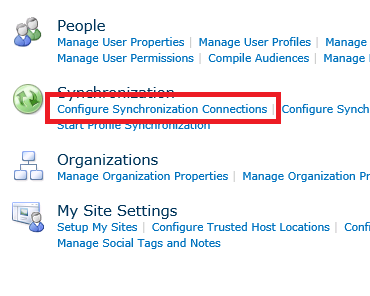 Add the DNS alias to the Alternate Access Mappings in Central Administration. This will require access to central administration. The set of encryption keys for these chunks of content is itself encrypted using an independently generated master key. The encrypted keys are stored in the SharePoint Content Database. The master key to decrypt the keys to the chunks is itself stored in a separate secure store called the Key Store. The “map” used to re-assemble the file from its components is stored in the Content Database along with the encrypted keys but separate from the master key needed to decrypt them. You experience a sudden site lock "read-only", what appeared to be a total lock down on the SharePoint sites. It results in ALL users, even site administrators and users with full administrative rights are unable to do anything! Nobody could add new documents or edit documents; nearly every single Document or Library option is greyed out! A possible cause could be that you started a SharePoint backup (during backup the site is locked) via Powershell and canceled the process while running. So the command is not able to unlock the sites afterwards. Problem: Do you know what your SharePoint Search Crawler is doing? 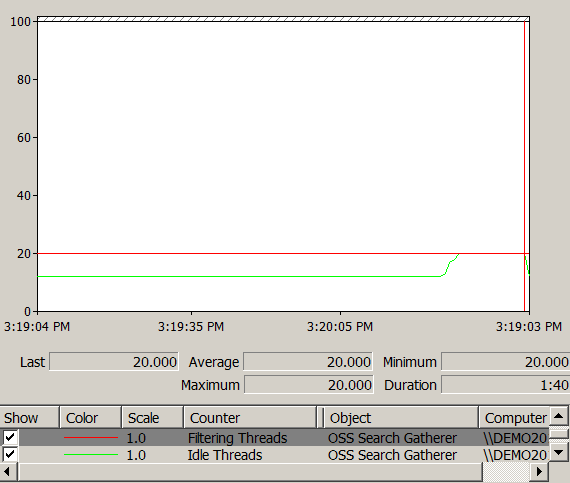 Solution: If you want to monitor what the SharePoint crawler is doing, you can watch the Threads Accessing Network, Filtering Threads and Idle Threads from the OSS Search Gatherer category in Performance Monitor during a content crawl. In my development VM, I see that the number of filtering threads stays at around 20 and the number of idle threads around 12 for the duration of the crawl which means that an average of 8 threads are being used by the gatherer process. 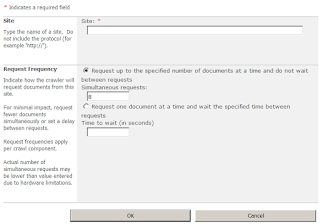 In SharePoint 2010, you can control the content crawl rate at the search service application level by using Crawler Impact Rules. By default, the number of simultaneous requests changes dynamically based on the server hardware and utilization. Crawler impact rules are often used to throttle the request rate for external websites. 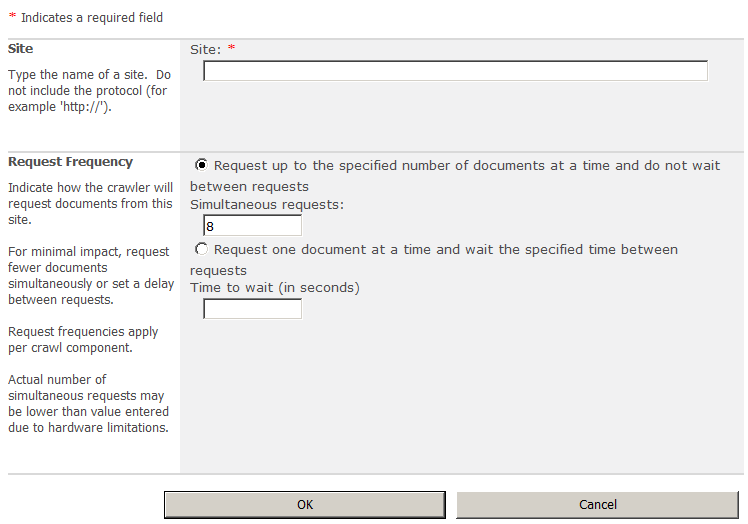 You can manage crawler impact rules in Central Administration > Search Service Application > Crawler Impact Rules. Next, let’s create a new crawler impact rule to limit the number of simultaneous requests to 2 using the * site name wildcard to apply the rule to all sites. 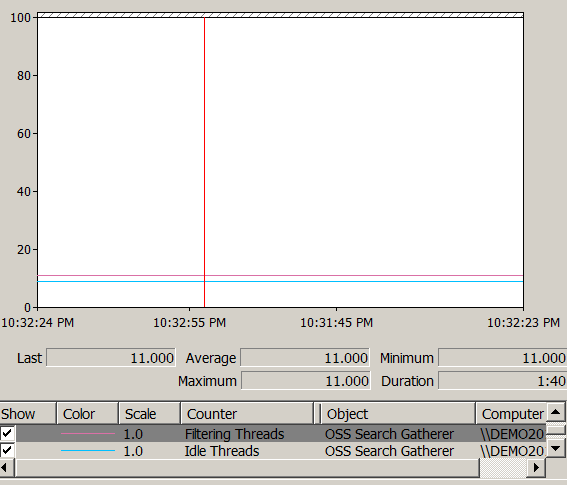 If we keep an eye on the performance counters this time, we can see that now the difference between the number of filtering and idle threads during a crawl equals to 2 (11 filtering threads and 9 idle threads in the example below). The performance counters confirmed that our new crawler impact rule is working. Be careful when you delete a crawler impact rule though! I’ve seen it a number of times in different SharePoint farms that SharePoint remembers and keeps using the last deleted crawler impact rule. I verified it by monitoring the performance counters – the deleted crawler impact rule remains in effect until the the SharePoint Server Search 14 service is restarted (or a new rule is added that overrides the deleted rule settings). So remember – restart the SharePoint Server Search 14 windows service after deleting a crawler impact rule! When you create your own SharePoint WCF Service in the ISAPI folder you might encounter the following error when sending to large Xml. 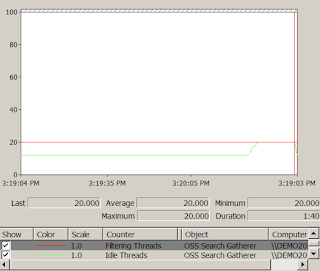 The maximum array length quota (16384) has been exceeded while reading XML data. This quota may be increased by changing the MaxArrayLength property on the XmlDictionaryReaderQuotas object used when creating the XML reader. You need to create your own Service Host Factory. Service="ExampleHostFactory.TestService, ExampleHostFactory, Version=1.0.0.0, Culture=neutral, PublicKeyToken=11e99323d9a22b04"
Do you have disabled users from active directory appear in SharePoint? There are scenarios you might observe disable person's details will appear in SharePoint people search, they will still show in the organization chart webpart in my site etc. In the configuration of the user profile service you can filter the disabled user accounts from active directory to SharePoint. From the connections you are using click on Edit Connection Filters menu. It will open the Edit Connection Filters screen from that you can see Exclusion filter for users. In Exclusion filter for users enter the below values. Once you enter the required values click on Add button and it will show the below details in Exclusion filter for users section. Finally click on ok button to submit the Edit connection filters details. Once you are done do a full synchronization run. This does not filter users in the SharePoint address book. By configuring the settings for the control, you can filter and restrict the results that are displayed when a user searches for a user, group, or claim. Those settings will apply to every site within the site collection. I am an independent Solution Architect and Senior IT-Consultant based in the Ruhr area in Germany. I have worked with Microsoft technologies for around 10 years and I am SharePoint and .NET MCPD certified.